← Every Dawg Should Have His Day, Right? 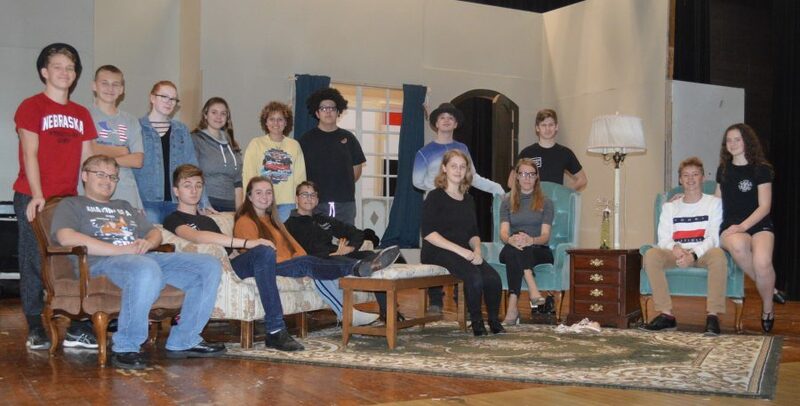 Shown are some of the cast members for Wawasee High School’s fall play, “You Can’t Take It With You.” Seated, from left, are Conner Lucas, Nick Lesko, Bronwyn Bonner, Devin Van Lue, Rebekah Whirledge, Genevieve Cierpilowski, Jared Krugman and Brianne Stewart. Standing are Isiah Faurote, Dylan Minear, Adrianna Clark, Grace Morrison, Tia White, Andrik Bautista, Bennett Mickley and Evan Coblentz. SYRACUSE — It’s a dilemma faced by the corporate world for multiple generations. At what point is work becoming too draining and what is really more important, making money or enjoying life? Wawasee High School’s fall play, “You Can’t Take It With You” is the classic and timeless story of balancing work and home life with a comedic twist. Written by George S. Kaufman and Moss Hart, the play premiered on Broadway in 1936 and was later adapted into a movie starring Jimmy Stewart. Show times will be 7 p.m. Nov. 2-3, and 2 p.m. Nov. 4 in the high school auditorium. Tickets cost $5 when purchased online at wawaseeperformingarts.ludus.com or are $7 at the door. Seating is general admission.